Their live shows feature guitars, live drums and vocals, with a multimedia backdrop. In 1998, Aizen and Duvdevani began playing together. At first they released a few tracks as "Shidapu & Duvdev". These tracks were 'happier' and on the simpler side of trance. 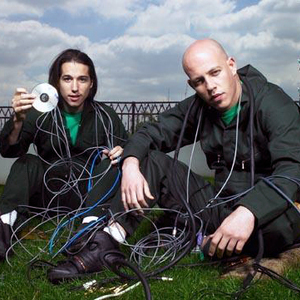 Later on, they formed the duo "Infected Mushroom" and started working on their first album. The name "Infected Mushroom" was taken, without permission, from a disbanded (1989 to 1993) punk rock band of that name also of Israeli origin, which Duvdevani knew and saw perform at a concert in Israel. 1999's "The Gathering" was the breakthrough debut album for "Infected Mushroom". The album featured a dark, rhythmic atmosphere exemplified in the song "Psycho", which gathered much acclaim and popularity. This album was one of the first albums to bring Israeli psy-trance to more 'mainstream' audiences, and contributed to the gradually growing popularity of the genre world-wide. The following year, the duo released one of their most well known albums, also being one of the most well known albums in the genre today, "Classical Mushroom". The album showcased a track often cited as their most popular track, "Bust A Move". This album is commonly referred to as the best example of the group's efforts. "Infected Mushroom's" evolving style has also had its share of critics. 2001's "B.P. Empire" was well-received by many fans and critics alike. Especially renowned is the musical epic "Dancing With Kadafi"; segueing numerous styles of music, most notably through the use of strong middle-eastern style melodies and a classical piece halfway through (which showcased Erez and Amit's piano and violin skills). However, the album was not as popular with mainstream audiences when compared with earlier releases, primarily due to the less accessible melodies in most of the tracks. The album was also seen as a break away from the more traditional styles of psy-trance by many psy-trance purists, who felt that the new territories explored went beyond the bounds of psy-trance but not necessarily in a progressive sense. The group's most controversial album proved to be "Converting Vegetarians" (2003) which featured 2 discs (also known as 'sides'). The first of the 2 CDs is the inoffensive Trance side, which contains mostly trance-like dancefloor material. The Trance Side is a logical progression of their earlier work (although it is cited by some as less imaginative than their earlier work). The 2nd CD is entitled The Other Side, and it contains mostly genre-bending experimental music - ranging from the R&B inspired title track "Converting Vegetarians" (which was the first true display of Duvdev's characteristic voice) to the more down-tempo laid-back "Elation Station", and also from the electro-pop tracks "Blink" and "Illuminaughty" (with vocals by the well-known UK psytrance vocalist Michele Adamson) to the short and experimental "Shakawkaw" (later expanded to a full length track). The album also contained the track "Ballerium", which was originally recorded as a soundtrack to an up-and-coming internet game and later scrapped by the game designers. The remainder of the CD went on to reveal other musical stylings, including "I Wish", lead by a carefully vocoded vocal line. The release of "IM the Supervisor" in 2004 (often incorrectly referred to as "I'm the Supervisor"), further surprised listeners with yet another mix of psy-trance with other musical genres. The album was criticized as being too "commercial" by many fans, but became "Infected Mushroom's" best selling album up to that time. Guitarists Tommy Cunningham and Erez Netz joined in 2004 - Tom plays with "Infected Mushroom" in the United States, while Erez Netz plays the rest of their gigs. Netz is a famous guitarist from Israel, and he opens their live shows with some electric guitar exhibition - playing with his mouth. In December of that year, "Infected Mushroom" moved from their base in Haifa to a new studio in Los Angeles, California. As of 2007, "Infected Mushroom" have also brought in Brazilian percussionist Rogerio Jardim to play drums and percussion during their shows. Also that year, Infected Mushroom rose to #9 in the influential DJmag Top 100 DJs poll, where they were the highest placed psytrance DJs. This was the first time the category had been created, reflecting psytrance's rising popularity around the world and the pioneering role Infected Mushroom have played in this. 2007 was also the year of "Vicious Delicious", possibly the most diverse album up to that point. The album begins with "Becomig Insane", an intense Spanish-guitar-led number, followed by "Artillery", a hip-hop track with vocal contributions by a guest artist. This divergence in genre in just the first two tracks of the album is a clear ultimatum for the critics to 'get with the programme'. Other tracks on the album also feature guest vocalists, along with the guitars and percussion of the newly-inducted Infected Mushrooms. The much-anticipated 2009 album bore the title "Legend Of The Black Shawarma" and featured remixes of "The Doors" classic "Riders on the Storm" and the evergreen Mushrooms number "Bust A Move", which is noticeably enriched by the DJs' well-matured skills. According to Duvdev, the title of the album is taken from a joke shared with an Australian friend who was describing his interest in having an up-close-and-personal experience in a shark cage. Duvdev's reported response was that the friend would look to the shark like a 'black shawarma', an enticing Middle-Eastern delicacy.